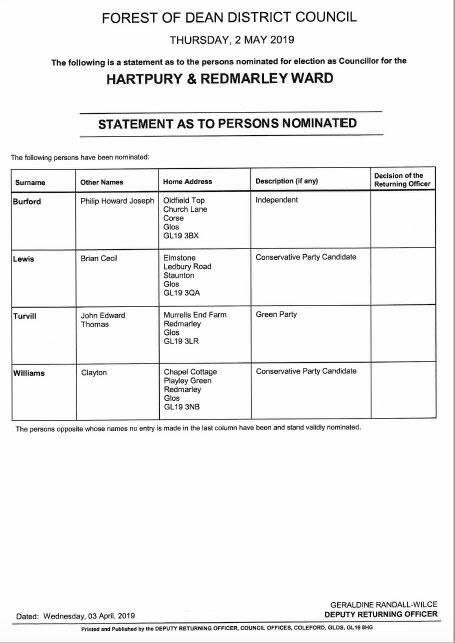 Below are the notices showing the candidates for the elections. For the District Council, Rudford and Highleadon has been reorganised into the Hartpury and Redmarley Ward, which will return two Councillors. On May 2, you will be able to vote for two of the candidates listed below. For the Parish Council, there are seven vacancies. 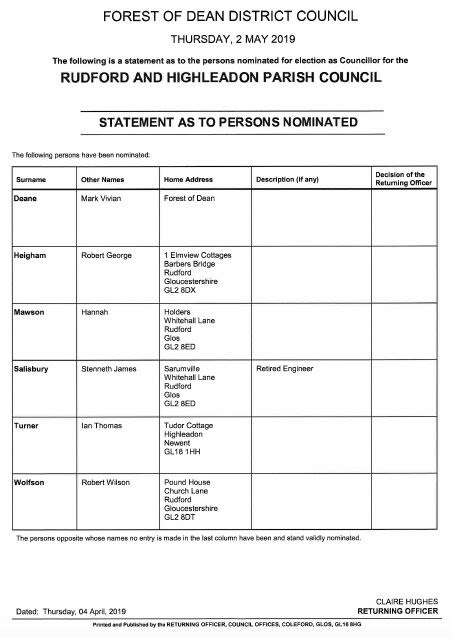 Six candidates have been nominated, and therefore there will be no election. We have been advised that the B4215 will be closed in successive sections from mid February to July 2019 while Severn Trent Water replace the main water main. The closure will affect from Two-Mile Lane in Highnam to Newbliss Straight south of Trioscape. The closure will remain in place over the weekend. They will be looking at weekend working to reduce the overall duration of the work. 4 January: we had expected to meet with the Project Team early next week, but this has now been postponed as we have been advised that the contractors are looking "at options to mitigate and review the project as there are a number of outcomes to explore." We will keep you posted. 25 January: we had hoped that representatives of Severn Trent would attend the Parish Council meeting on Monday 28 January to share their thinking on alternative options for the works. However, they have declined to do so, telling us that they are not yet in a position to say anything, but will be sharing their plans with businesses and communities before progressing them. 24 February: after the January Parish Council meeting, we wrote again to Severn Trent reiterating the concerns of local residents and seeking an early response. To date, no reply has been received. 29 March: Severn Trent have told us that "we are still reviewing the project and hopefully this weekend we will be undertaking a topographical survey to either validate or eliminate the option of relocating our assets into farmland adjacent to the B4215. As soon as we have completed our review we will communicate our new plans with you via various means including public exhibitions, by letter and local press, as well as attending meetings with yourselves." 10 April: we are advised that Severn Trent still has significant negotiations to undertake, and that therefore it will be some time before the new plans are brought forward, and very unlikely that any work will commence over the summer. You can find the minutes of recent Parish Council meetings under the 'Parish Meetings' tab of this website. If you can't find what you are looking for, or need to contact the Parish Clerk or a Councillor, please use the contact details on the 'Your Councillors' page, or the 'Contact' tab on this website.